Bulgaria collapsed at the end of September 1918 – this opened the Balkan front for progressing Entente troops. The Bulgarians concluded armistice and left the First World War, which made the loss of the war clear for the German leadership as well. However, the fall of the German Chancellor, Hertling was only the beginning of political changes that took place in central powers. The changes, the importance of which Count István Tisza – Hungary’s real leader next to or “above” Wekerle Prime Minister – could not grasp even then. Instead, Tisza slapped the table in front of the Serbs and Croats in Sarajevo, who then walked out on the raging, “wild fool from Geszt”, as Ady had called him back in 1912. In domestic First World War historiography, a country fighting on the side of central powers, who stood almost completely alone at some front sections with the multinational forces of the Entente, falls into the background. The country, which managed to display – but not equip and supply properly – 878 thousand uniformed people (including 697 thousand soldiers) even before the collapse, in September 1918. Bulgaria protected the majority of the Balkan front, i.e. the Southern battlefront in Macedonia for Germany and the Monarchy, until the last month of the war. So when war performance is concerned, it is worth highlighting the performance of Bulgarians as well in addition to Germans, Austrians, Hungarians and Croatians. According to an American professor, Richard C. Hall, in 1918, central powers could have hardly stayed on their feet if Bulgaria did not set all fight-ready men to war. According to the professor of the Georgia Southwestern State University, the central powers could have collapsed back in 1916, when Romanians entered the world war. At that time, Bulgaria, strengthened with German and Turkish forced, with their army, partly led by German generals, attacked the Romanians when they broke into Southern Transylvania. So it was not only the Macedonian (Saloniki) front that they held against the Entente. In addition, even though they only participated in the world war for three years, owing to the Balkan wars of 1912-1913, the Bulgarian manpower had been fighting for six years. If we do not believe Professor Hall’s reasoning at first, it is enough to remember what happened when Bulgaria ceased to fight for the central powers. At the end of September 1918, the Bulgarians could no longer hold the Macedonian front, at Dobro Pole, the Entente broke through their defensive lines, and the Monarchy’s politicians suddenly realized that the whole Balkan front would collapse in the near future, and it thus decided the end of the First World War. According to A. J. P. Taylor British historian, the struggles of the Western front had not brought about a final decision even at this time: it was certain after August 8, the “Black day of the German army”, that the Entente wins and even the German co-commander-in-chief, Ludendorff knew that they cannot win the war. However, he hoped to prolong fights until 1919. At that time, he wanted peace negotiations, rather than peace forced on the Entente by the Germans, as hoped upon the launch of the first German offensive in March 1918. The offensive in March was followed by a number of German offensives, but from July, the Entente took over the initiative in the West, but the Germans defended themselves stubbornly even in September, slowing down the advance of the British, French and Americans. The attack of Americans has stalled in the West even on September 26: They lost 100,000 people in the Argonne area – sacrificing US soldiers for about 12 to 13 kilometres of advance, says Taylor. The key moment, however, was not him, but the “bored” Guillaumat who was ordered back to Paris. He had enormous influence and he decided on the internal debate of the Entente that had been going on for many years. The Entente heads hesitated between the Western and the Balkan front, after the failure at Gallipoli, when they tried (in vain) to restrain the Turks at the Dardanelles in 1915, they did not really take care of the Balkan. 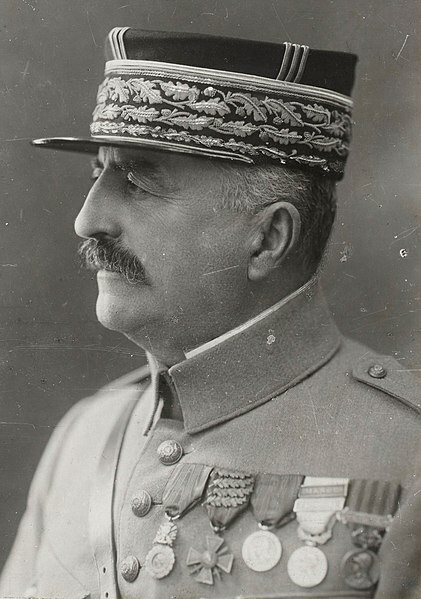 But Guillaumat persuaded the British and French Prime Ministers, Clemenceau and Lloyd George in mid-1918 to concentrate on the Saloniki Front and thereby Franchet d’Esperey was granted permission to attack. According to Taylor, the Bulgarian army was badly equipped and “gave up almost at the first strike”. This was not completely true, at Dojran, the Bulgarians kept their feet, they struck back nine gas attacks, but in the middle of the Macedonian front, at Dobro Pole, huge successes were achieved by the Entente troops. The Bulgarians were poorly equipped indeed, and many waited for the attack of the well-equipped Entente soldiers barefoot. According to the 1924 recollection of Stefan Tosev general, one of the largest world war Bulgarian commanders, not only soldiers, but also the junior officers began to flee from the army, which meant the final phase before the disintegration. Moreover, the Bulgarian elite and the Bulgarian public opinion become demoralized by this time: the Radoslavov government, which was sympathetic to the central powers, fell a few weeks earlier, since Germany and Turkey put Bulgarians into a humiliating situation, when the Romanian separate peace was concluded in May, and Bulgaria received small territories from the defeated Romania, which – especially Dobruja – they also had to share with the Germans and Turks. Moreover, the Turks, according to the American historian, Hall, submitted their claim in July 1918 to the part of the valley of the river Marica that was received by Bulgaria in 1915 for entering the war. That is, one of the central powers claimed a territory from one of its own allies. The situation of the German-friendly Bulgarian government became unsustainable and, in principle, the Entente-friendly Bulgarian parties governed in Sofia under the leadership of Alekszandar Malinov. The exit of Bulgarians from the central powers had a serious military consequence: According to Taylor, “The gate of Southern Europe was opened”: Franchet d’Espèrey advanced until the Danube – he reached the river on November 10 and continued the offensive. According to Taylor, the attack on the Saloniki front decided the old debate within the Entente between “West” and “East”-parties. Though it is also true that, if the Germans had not suffered defeats from July-August one after the other and their troops had not escaped in France and Belgium, they could have sent reinforcement to the Balkan front, but in the autumn of 1918, Ludendorff was not able to redirect his forces. That is, the war ended when the “Western” and “Eastern” strategy were combined. It is characteristic of the state of the Austro-Hungarian Monarchy that this state could not defend itself at all, Taylor did not even mention the forces of the dualist state after the breakthrough on the Saloniki front, although the Monarchy’s troops were of course the closest to the Bulgarians – to the West from the Macedonian front, the Monarchy held the Balkan front in Albania. Meanwhile, let’s have a look at what the actual number one political leader of contemporary Hungary, the nowadays re-evaluated and “newly evaluated” Count István Tisza did. In fact, he proved his complete inability to lead the country (though he was not formally a leader, but had a huge influence on government policy and Prime Minister Wekerle) at the time of the defeat. Tisza still had the parliamentary majority, the members of the Party of Work in the Parliament. The electoral law was also passed by the Parliament as Tisza wanted. With a slight exaggeration, we could say that the government governed, but in the Parliament, the Party of Work and Tisza had the decisive word. However, the ex-Prime Minister, overthrown in 1917 – practically by Charles IV – did not yield even in the last minutes before the total defeat of the Monarchy. Tisza did not give up dualism, was unable to make concessions to the Croatians who might have been held back from the coalition with the Serbs, i.e. the creation of the Southern Slavic unitary state, with the promise of trialism, the three-centred reorganization of the Monarchy. Though there was only a slight chance for this, since the Entente had already decided to stand for Czechoslovak and Southern Slav claims by this time. However, one thing was certain in case of Croatians: they wanted independence from Hungary, either within or outside the Monarchy, and refused the known form of dualism until 1918 by the end of the war. But Tisza did not admit that the prevailing system of dualism was unsustainable. So Tisza was in Sarajevo when the Entente made the last and decisive war of the world war on the Macedonian front in the middle of September. Tisza was unable to make a compromise even at that time. He complained to Sarkotić colonel general, Bosnia’s military governor about seeing the Southern Slavic population, which had seemed to be reliable, disloyal and confused. According to Vermes’s biography, Tisza then welcomed a delegation of Bosnian Serbs and Croats where they gave him a memorandum, in which the signing South Slavs opposed the annexation of Bosnia and Herzegovina by Hungary. (This is how Hungarian politicians wanted to prevent the emerging Southern Slavic ideas – at least in their own imagination, since they would not have had military strength for this in 1918). According to the records, Tisza “was shaken by anger” after receiving the petition and named it a “shameless challenge” when he was talking about it with Sarkotić. Sarkotić then wanted to dissuade Tisza from another meeting, but he wanted to demonstrate power to the Serbs and Croats. He closed his speech as follows on the next meeting: “Have I come here to listen to this stupidity?” , and he banged the table. (Later, Southern Slavic legends spread that he supposedly whipped his horse whip in front of the delegation – but no Hungarian recollections refer to this.) Earlier, he told the Bosnian delegation that Hungary was able to destroy its enemies before its fall, writes Vermes. All this happened nine days before the Bulgarian armistice, but the incredibly “short-sighted” politician, filled with “blind self-confidence” (as Vermes characterised him), swashbuckled in vain, a member of the Southern Slavic delegation, dr. Karlo Ikić, after listening to Tisza’s rebuking closing words, told the following to the members of the Bosnian Serbian-Croatian delegation: “Hajdemo!” (Let’s go!) Then they turned around and left, said Vermes. Tisza, shocked, only said: “Go! It’s even better!” (All this is mostly known from Béla Nádasdy lieutenant colonel and Sarkotić.) Nádasdy already criticized Tisza on the spot: it was pointless for him to speak with the delegation, but his blind faith did not allow him any rationality: “You are not right! You are not right! I had to tell them this! They have to believe that we cannot stand badly if I dare to speak like this”, said the politician, nine days before the collapse of the Balkan front and Bulgaria’s armistice request. Of course, Tisza’s incredible behaviour did not change the course of history decisively, and gave the Croats and Bosnian Serbs good grounds to clearly turn towards the establishment of the Southern Slavic united state upon seeing the change of the military situation, now also referring to Tisza’s behaviour. (Nádasdy and Sarkotić also thought so later.) According to Vermes, in the Southern Slavic territories, “almost all political groups adopted the program of establishing the independent Yugoslavia in a smaller or greater extent, less or more openly”, already before Tisza’s visit, but after the Bulgarian collapse, Bosnian Serbs also turned against Hungary. Vojislav Šola, the primary Serbian leader of the Sarajevo delegation, openly told Sarkotić: “he was turned from loyalty to Hungary toward the Yugoslav idea suddenly by the change of military situation”. But let’s see what Hungarian papers wrote in the month of the Bulgarian collapse, on the first of September. On September 8, Népszava reported on fierce firefights in the region of Dobro Pole, as regards the Macedonian front. Here the English made a strong artillery attack where the breakthrough took place later. On the same day, Pesti Hírlap wrote in its title: the “Bulgarian government does not seek approach” to the Entente. According to the Hungarian paper, Gresov former Bulgarian prime minister was not in Switzerland for this reason, but “went to Switzerland to visit his sick son”. At this time, the Entente-friendly government was in power in Bulgaria, under the leadership of Alekszandar Malinov, but this government still held the front in Macedonia. Malinov formed government in June with the support of Stojan Kosturkov, they both supported the Entente and, according to the book of Koszev, published in 1971 in Hungarian, Bulgária története (The history of Bulgaria), the Bulgarian people also “demanded the end of the war more and more firmly”. Pesti Hírlap reported on September 19, 1918 that „in Macedonia, in the front section to the East from Cerna, the united French, Serbian and Greek troops started an offensive against the Bulgarians since September 15, who are supported in order to defeat the attack by German battalions, as noted by Ludendorff’s report.” All of this has shown what military historians know well: at this time Germany was present on the Balkan front only with “battalions”, i.e. poorly equipped, barefoot and starving Bulgarians were practically left alone against Entente forces in Macedonia. The next day Pesti Hírlap wrote, referencing French reports, that “the Entente troops – including one division– forced back Bulgarians with around 7 kilometres on the 125 kilometres long front”. Pesti Hírlap reported information about the last substantial fights on September 27, but these rather described the operation of the military censorship than reality. The title was true: “The situation is serious on the Bulgarian-Macedonian front”, but in fact, it did not reflect the exact situation. At this time, Hungarian papers published semi-official reports of the telegraphic news agency. (Budapesti Hírlap had the same report title as Pesti Hírlap, and practically the article was also the same, and also referenced the telegraphic agency.) After describing the military situation, Pesti Hírlap wrote: “The supporting intervention of Hungarian-Austrian teams encountered enormous difficulties due to bad traffic conditions. These events of the Macedonian battlefield must influence the military situation of Hungarian-Austrian troops in Albania. The commandership has to draw the necessary consequences to ensure that their stands there are not endangered.” The announcement also revealed that the deterioration of the military situation could now have political consequences, but these are not revealed in the report. On September 28, Pesti Hírlap wrote what could have been known earlier too: German and Austrian papers already wrote a day earlier that the Bulgarian government asked for armistice from the Entente. “According to the official report, peace delegations of Bulgaria travelled to Saloniki already that day – on Wednesday –, and the parties who gathered around the government turned to the army and the nation in a manifesto to remain disciplined, the sobranje [Bulgarian legislation] will bring peace to success. This is what happened in Sofia in the afternoon.” So Hungarian papers could report on this only on Saturday! Meanwhile, on Friday, papers in Vienna and Berlin wrote a lot more about the Bulgarian peace offer. At that time, Hungarian papers still hoped – partly based on information from Germany – that the government’s step may be not followed by the Bulgarian army, but these proved to be vain hopes. In fact, Bulgarians were rather concerned with defeating their own rebel soldiers, not further fights. On September 29, 1918, Pesti Hírlap wrote that the chief lieutenant of Entente troops in Saloniki does not give an armistice, but informed the French government about the arrival of Bulgarian parliamenters. Franchet d’Espèrey “may not permit either an armistice, or the cessation of arms, which would interrupt the ongoing operations, but is willing to receive the legally authorized delegates of the Bulgarian government”. Soon, negotiations were started indeed and the Bulgarians signed the armistice conditions, which were very tough, but as we mentioned before: avoided the Serbian and Greek occupation. However, Bulgaria again suffered territorial losses, as they were approved by their peace contract in 1919. Meanwhile, the Hungarian government, Sándor Wekerle gave a false statement to the press: “We do not have to be scared. The situation does not give reason for this. We seriously seek peace, but we have done the necessary steps to secure our front.” The politician under Tisza’s influence made this statement after the Bulgarian collapse, but before the collapse of the Monarchy. Pesti Hírlap also quoted Count István Tisza who returned from his failed Balkan trip and “answering the questions asked from him, the situation is nevertheless serious. We could believe that the Balkan issue is not treated in accordance with our wish, and now an entirely new situation occurred. In this moment, in addition to the military measures already made, the main thing is that the nation does not lose is moral power and cold blood. This is the only way to prevent greater troubles and support the opportunity for peace making. Therefore all Hungarian people are obliged to influence that the moral power and cold blood of the nation and individuals are not shaken.” So practically Tisza encouraged endurance and pretended as is peace making was dependent on the Monarchy even if it was not so then: the Entente approached the Southern borders of the Monarchy and the politicians of Vienna and Budapest were unable to do anything. However, Tisza did not recognize, or did not admit the situation. All this has shown that the collapse of the Bulgarian front has even shaken Germany, but according to Hungarian leading politicians, the case was only “serious” (István Tisza), according to Wekerle, “we do not have to be frightened”. However, they were not able to conceal the truth much longer, the Monarchy and the days of historic Hungary were already counted.